We are the premier pawnshops in Waldorf and Oxon Hill. Our flagship location opened four years ago in Charles County and our larger store has been serving the DC Metro area for almost thirty years. We are known for giving Top Dollar on every loan and buy we do. We pay more on scrap gold, diamond rings, electronics and more. Got timely response and was able to sell the next day. Got the price quoted by Top Dollar Pawn. Will definitely use this site for future. Great service and Positive staff across the line. Will come back again for sure to let go of future equipment. The service was outstanding...the attendant...Ron.. was exceptional and all business and polite. Great I will deal with this pawn shop exclusively in the future. 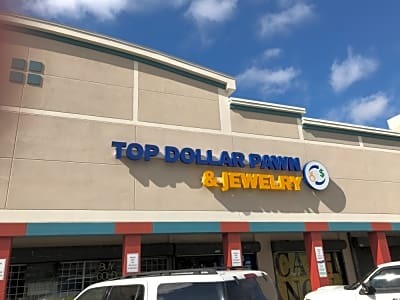 On Friday 1/27/2017 my wife and I visited Top Dollar. We were treated with the utmost respect. We observed, Mike and Sabrina interact with the clients in front of us they treated them with knowledge, kindness and caring....I thought that Mike could be related to the client, but when I stepped forward I realized this is just who he is! Mike treats everyone like family...shows respect, professionalism and kindness. I am recommending Top Dollar to friends and family ... And for all my future needs, WE WILL RETURN!